It’s the wearing, drinking, eating, and celebrating of the green on Historic River Street! Join us for our largest festival of the year! 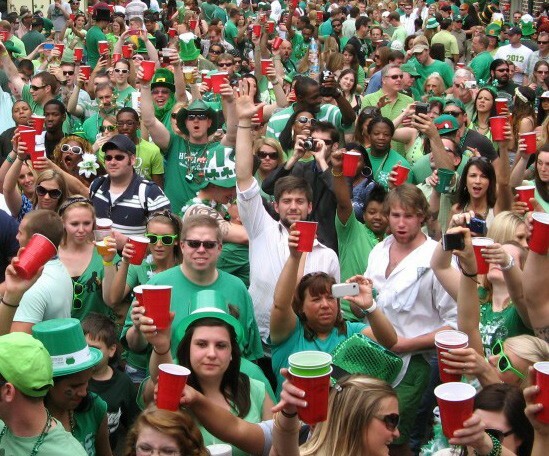 The 2015 River Street St. Patrick’s Day will take place March 14-17. Festival hours are Saturday, March 14 from 10am-1am, Sunday, March 15 from 12:30pm- 10pm, Monday, March 16 from 11am-midnight, and Tuesday, March 17 from 10am-10pm. Enjoy live entertainment on two stages on River Street with 27 performances from local and regional bands over all four days. The Bud Light stage will be located in the parking lot across from Kevin Barry’s Pub and the United Stage will be located across from Tubby’s River Street. Make sure to journey down “Up for Whatever Way” (just follow the blue lights along the Abercorn Street Ramp) to the Bud Light “House of Whatever.” This includes DJ music, live karaoke, a photo booth, flash mobs, the ROCK 106.1 VIP lounge, and giveaways that you can only win if you are “Up for Whatever.” You can also “Find your Beach” with Corona Light (in front of the riverboats) complete with palm trees, beach chairs, and a prize wheel! Don’t forget to search for the tiedye SweetWater tent where we you can purchase tickets to participate in some classic and not so classic carnival games for a chance to win limited edition SweetWater St. Pat’s schwag. 100% of proceeds go to the Savannah Riverkeeper. Water is a vital component in beer and the Savannah River is a vital component to the City of Savannah. No better cause to support while sipping a SweetWater right by the Savannah River! Don’t forget your ID and make sure to grab your wristband to enjoy your adult drink to-go while walking around the biggest party of the year! Wristbands are $5 per day and can be purchased at one of 26 locations downtown. For more information on festival hours, wristband and more visit riverstreetsavannah.com.